In the first century AD, Pliny the Naturalist stated, “Diamond is the most valuable, not only of precious stones, but of all things in the world.” As colored-gemstone addicts, we believe he had this half right. Over the years, the diamond has been both culturally important and industrially significant. For many centuries, the wearing of diamonds and valuable gemstones was restricted to royalty and unlawful for commoners. The concept of the diamond as the engagement stone grew exponentially in popularity during the twentieth century as the result of a very strong marketing campaign by De Beers, a legacy that has allowed us to produce some killer engagement rings. Here at Featherstone, we use diamonds both as the footlights to reflect light on our painstakingly selected colored gemstones and industrially: many of our drillbits are diamond-coated, which insures both accuracy and precision in our work. Since diamonds and stunning gemstones are perceived as formal, they don’t get worn nearly as often as we wish! We like to enhance our everyday style with a little sparkle, and diamonds make every day more special. 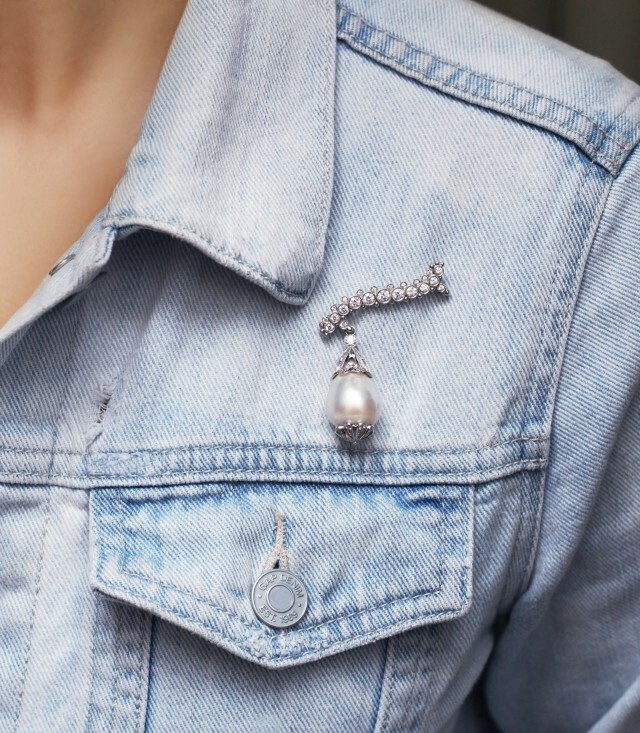 Denim makes room for diamonds in casual wear, while the jewelry lends jeans a little bit of sophistication.